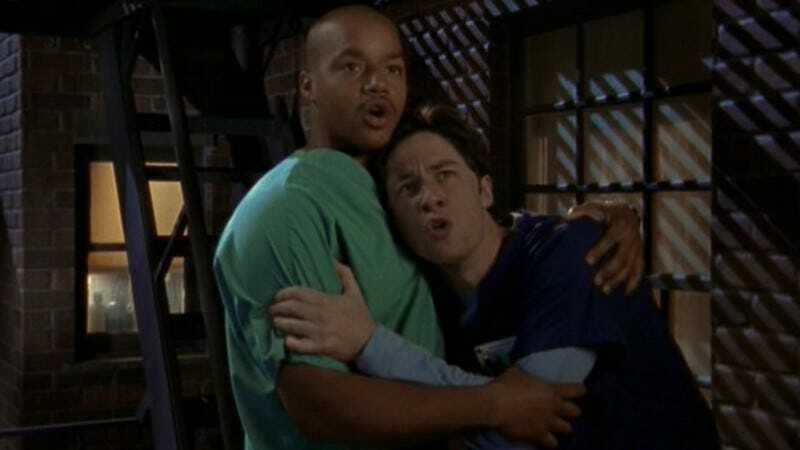 Earlier today, we reported on how Parks & Recreation‘s Ron Swanson and Leslie Knope would’ve felt about Indiana’s “religious freedom” law, and now we have a similar response from Scrubs’ Dr. John Dorian and Dr. Turk Turkleton—or, rather, from Zach Braff and Donald Faison, the guys who played them. Instead of taking an overtly political stand about the law itself, though, Braff and Faison chose to focus their attention on the controversy surrounding Memories Pizza, a restaurant in Indiana that announced it would exercise the “religious freedom” this law granted it by refusing to cater a gay wedding—a crushing blow to however many people would want this one pizza place to deliver food to their reception. Maybe these guys have the best pizza in Indiana? Maybe it’s the only place that has pizza in Indiana at all? Either way, it was a brutal move. However, even though the people at this pizza place were citing their “religious freedom” to discriminate against whoever they choose to, Braff and Faison believe that it’s wrong to deny pizza to someone who wants pizza. That’s why, as Braff announced on Twitter, they’re going to bring pizza to any gay weddings in Indiana that want it. He even says that he and Faison will “make it,” though just having them show up with pizza would still be pretty cool. Braff doesn’t explain how to go about hiring them to cater your wedding, but you could probably just send him a message on Twitter or whatever. Also, someone please take him up on this.